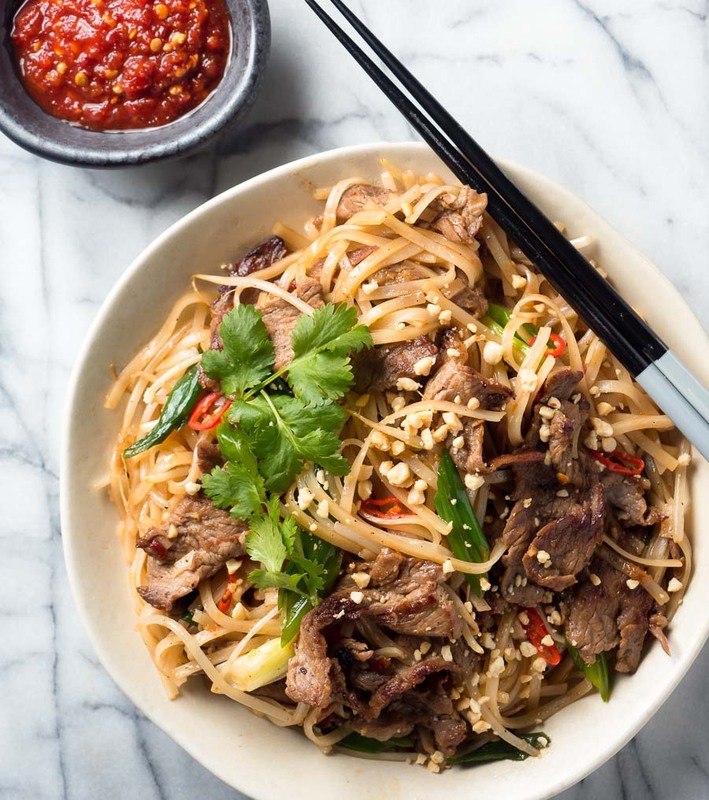 Thai beef noodles. Takeout flavour with ingredients you can get at the grocery store. No specialty market required and easy to make as well. 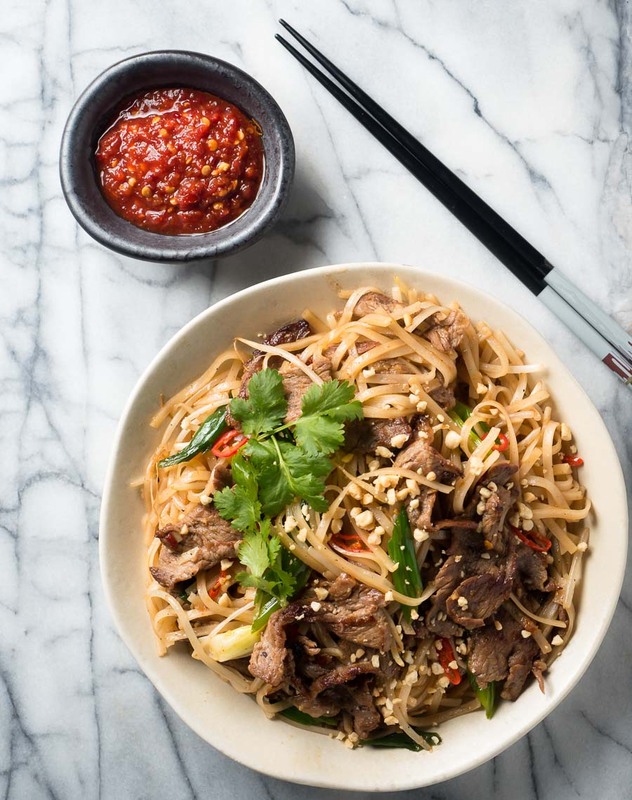 Thai beef noodles are a tasty weeknight dinner. They’re a bit different. Not like pad thai really – although you could be forgiven for thinking that. Garlicky, sweet, salty, spicy. A little bit smoky. Lots of big flavours going on. Good complexity. Good balance. Imagine you were in Thailand and you ordered this on the street. The guy making it would have his prep done. You should too. This goes fast. Heat up a wok and go. Cook the beef. 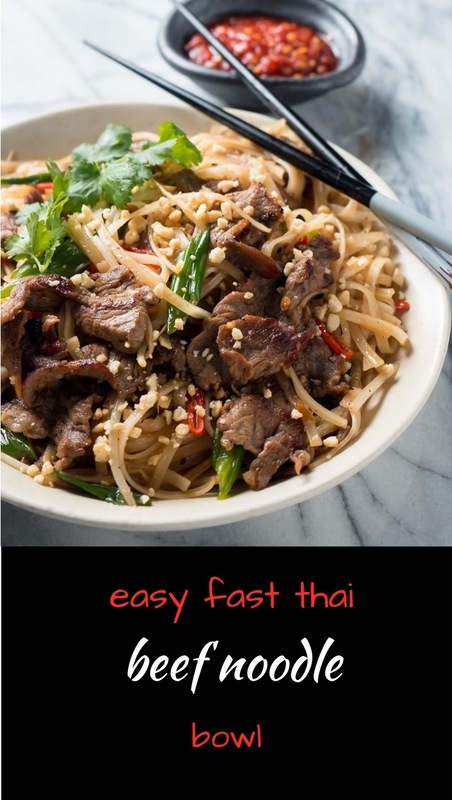 After that, you’ll have Thai beef noodles on the table in a couple minutes. Yes, that fast. You should probably only make two servings at a time. Too much in the wok and it will steam. Steam is bad. Sorry noodles in the making. You are frying the noodles. Nicely coated is what you are after. The trick is to cook all your beef up front. Have it ready to go and the rest comes together in a couple minutes. Literally. Two minutes an order. Street food. Restaurants have high output burners. Seriously high output burners. That’s how they get that smoky stir fried taste. Regular stoves don’t have that kind of juice. So you need to adapt. Turn your heat up to max. Don’t be scared. Even at max heat you aren’t close to what they are using. Fry your beef in batches. If the heat isn’t high enough the beef with throw some liquid when it cooks. You’ll get grey beef. Boiled. You don’t want that. If you see it happen you have too much beef in the pan. Or not enough heat. Or both. Don’t panic. Spoon out the liquid. Add a bit more oil. Turn up the heat. Get that beef to brown. Same goes for the rest. You want that smoky flavour. It’s magic. Keep the heat high. Work fast. If you can taste a bit of smoke in the final dish you’ll know you nailed it. You’ll be spoiled for life. It’s so good. Play with the ingredients. It works with shrimp or chicken instead of beef. Like it spicier? Up the chili or the sambal oelek. There’s no hard and fast rule on exactly what this dish is about. Street food is like that. This isn’t Cordon Bleu. There is no Thai noodle police. The only thing you probably shouldn’t change is the sauce. If you change that you’re making something else. Nothing wrong with that. Just different. As with any Thai noodle dish, the noodles are key. Do not boil your ban pho. Just don’t do it. Instead, soak them for about 45 minutes in warm water. They will soften just enough. Then toss them in hot oil until they are well coated. Do this before you add the sauce. It works. Bon Appetit recently decided that sambal oelek was a trendy ingredient. It’s a great chili paste so I do urge you to listen to them and find a jar. It’s been my go to asian chili paste for as long as I can remember. Any asian market should have it. 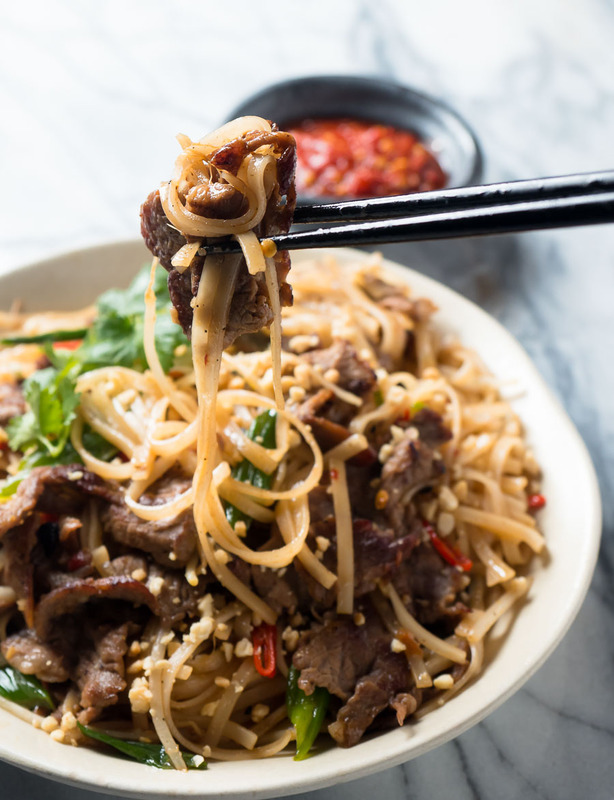 Thai beef noodles. Weeknight fast. Restaurant flavour. Street food fast. Easy. Delicious. Try it. You’ll be glad you did. 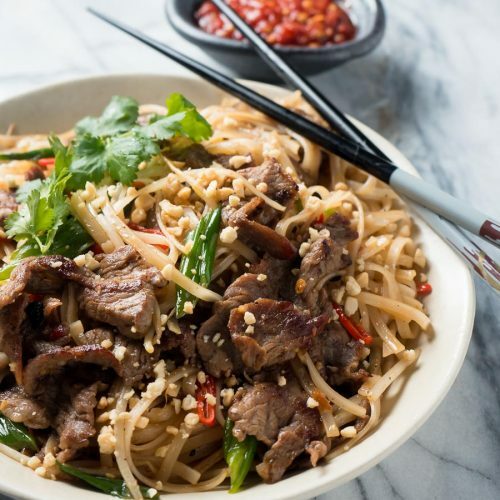 Thai beef noodles make a great dinner any night of the week. Fish sauce may sound scary but it's in everything you get at Thai and Vietnamese restaurants. It makes a difference. Soak the noodles in warm water for 30-45 minutes. Combine the marinade ingredients. Add the beef and set aside while you prep the other ingredients. Mix together the sauce ingredients and stir well. Heat a wok over high heat. Add 1 Tbsp oil. When the oil is shimmering, add the beef and marinade and cook until the beef loses its red colour, abut 2 minutes. If the beef throws some liquid spoon it out. Add a bit more oil. Turn up the heat. Brown your beef. Grey is bad. Brown is good. Go a little longer if you have to. You really want some brown. Remove beef and wipe out the wok with paper towel. Return the wok to high heat. Add 2 Tbsp oil. When the oil is shimmering, add the green onion, garlic and red chili and cook about 15-30 seconds. You are going to get some of the smoky flavour from the onions so don't lay off the heat. Add the noodles and stir until well coated with oil - about 30-45 seconds. 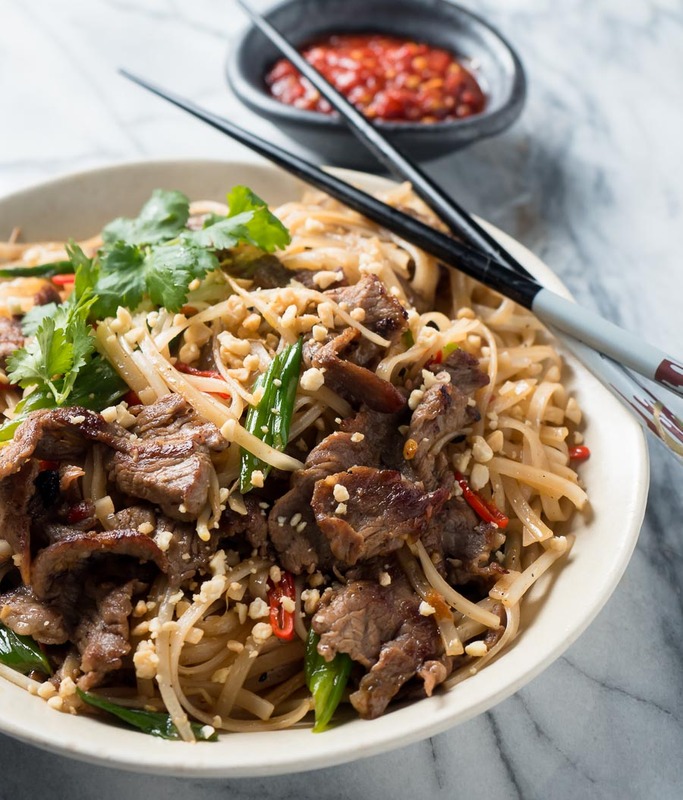 Return the beef to the wok along with the bean sprouts. Stir briefly and add the sauce. Add half the peanuts. Stir to combine and cook, stirring constantly, for one minute. Serve topped with peanuts and additional cilantro. 2 servings will fit reasonably in a wok. If you want to cook for more you will need a big wok or repeat the recipe as needed. Don't boil the noodles - you will get mushy noodles. Take the time to soak them. It's important. In beef, main course, meat, noodles, thai. Bookmark the permalink. Thank you. I’m a big fan of the wider ones. I find they are just a bit more satisfying than the narrower ones for dishes like this or pad thai. I was so sad when I realized there was no good thai take-out in my new town. But, this looks easy enough and probably quicker than waiting for delivery anyway! Also, I’ve made the mistake of boiling rice noodles, so your note is really important! It’s amazing to me. Some packages actually have instructions on them telling you to boil the noodles. There must be a reason but for any of the fried noodle dishes it just doesn’t work. Hope you like it. This is my kind of recipe!! I absolutely love all Thai noodle dishes! This one looks like a cross between two of my favorites: pad see ew and drunken noodles! I will definitely try this recipe soon! Alyssa – that’s a very interesting observation. I suppose you could tweak the recipe in one direction or the other depending on what dish you were leaning towards without too much trouble at all. This looks great! I love the wide noodles, too. Do you think sambal oelek is trendy enough to find in a small town grocery store? I’ll look for it next time I’m shopping! Otherwise, I will definitely have to get some the next time I’m in Portland! Sambal oelek is big in Indonesia so the Dutch brought it back with them. I don’t think it’s that hard to find. Any asian market and big grocery stores have it where I am. I like it a lot more than Sriracha. It is a more subtle flavour profile (not so heavy on vinegar) so it slides in beautifully in many dishes without overpowering. Hope you find some. This recipe was delicious!! I didn’t have sake so I used rice vinegar and it was great! I’m so glad you liked it Maryam. Good substitution tip with the rice vinegar. I will keep that in mind next time I’m out of sake myself. This looks fantastic! I’m always looking for more thai dishes to make–this one is definitely at the top of my list! It’s a house favourite. I hope you like it as much as I do. I love Thai food, but am not so good at recreating it at home. You’ve definitely inspired me to broaden my grocery store horizons! Super excited to try the sambal oelek! I made those rotten mushy fried goop noodles for too long. No more! Cheers and a glass of sake to you.